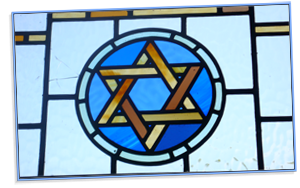 Everyone is welcome to all of our services – members and visitors, adults and children, committed Jews and those who are searching for spiritual meaning or simply to be with a welcoming and warm congregation. Once per month we gather for our Shabbat Evening service and Charuvah Supper, starting at 6.30pm. Usually this takes place on the first Friday of the month, but this may change from time to time. The service includes the lighting of the Shabbat candles, Kiddush and the traditional prayers and songs for Shabbat evening. Siddurim are provided for all so that you can follow the service and this includes transliteration so that all can participate in the Hebrew of the service. 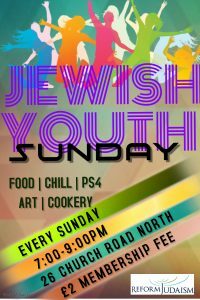 Following the service we share a Chavurah Supper and welcome anyone who seeks good company on Shabbat evening. At our Shabbat Shacharit morning service men and women sit together and we use the Reform Movement Siddur. Our Shul Singers (we prefer not to describe them as a formal choir), help to make the music of the service special. Children, the life of our community are included as much as we can in our main service. They are welcome to come and go throughout the service. After the traditional opening songs and prayers in Hebrew and English, following a procession accompanied by song of one of our historical Sefer Torah (one survived the holocaust and came from Czechoslovakia ) then comes (the reading of) the Torah portion followed by the reading of the Haphtarah in English. Most weeks a member of our congregation (we take turns) gives a D’var Torah to provide a contemporary focus or meaning to that week’s Parasha helping, we hope, to keep the message of Torah alive and relevant. Aliya’s are often given not only to our members but also to any visitors to make them feel welcome. The haphtarah is read by another member and yet another will read the Prayers for the Community. 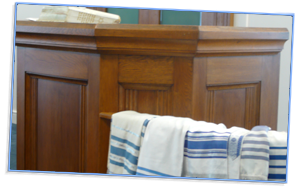 Some Shabbat mornings we also celebrate the Bar or Bat Mitzvah of a young person who will lein the Torah portion of the week and will give the D’var Torah for that week with their own very personal interpretation. 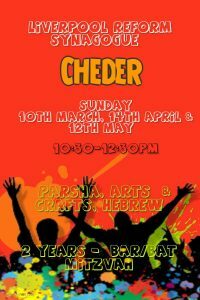 This service begins at 10.30am and typically ends 12.30pm with a Kiddush where we come together with everyone to share wine and challah, and other foods. All in all we are a warm and welcoming family orientated congregation and hope that if you choose to join us in prayer that you will feel recharged and fulfilled by the experience.